For a first-time condo buyer, just simply throwing your hat into the intimidating ring of real estate, mortgage applications and bank meetings can be a stressful proposition. Toss in the new changes surrounding Canadian mortgage rules that have come into play over the past several months, and suddenly all that saving and planning you’ve done for the past several years seems like it might not be enough anymore. The new Canadian mortgage rules introduced over the past few months are definitely aimed at making sure Canadians are more financially prepared when buying a home, but that doesn’t mean you have to give up on your dream of condo ownership just yet! We’re joined today by John Mayberry, Realtor® from the Calgary Home Boys and Josh Higgelke, Mortgage Broker of Record for Mortgage Connection, and they’re here to help walk us through what these changes mean for first-time condo buyers here in Alberta, and how you can set yourself up for success. While you may have heard that the government’s rolled out some changes to mortgage rules here in Canada, you might not be quite familiar with what these adjustments entail. Essentially, the Canadian government has made alterations to the way mortgage rules work in an effort to ensure that as interest rates rise (which they finally started to do again, in 2017), Canadians are still able to afford their homes. To do so, they’ve implemented what’s referred to as a “stress test,” which is meant to help homebuyers avoid going into additional debt in order to afford to pay their mortgage. While these changes will be helpful in cooling down some of the red-hot real estate markets across the country (for example, in major centres like Vancouver or Toronto), the overall result will be a reduction in buying power for Canadians, as debts that exceed a ratio of 2:31 will no longer be considered for lending. This is unfortunate news for many Canadians, as it means they may not be able to buy the same home they would have been approved for a year ago. However, that doesn’t mean you’re locked out of buying that first condo just yet – it just means you might need to make a bit of a new plan to move forward. Where to start. If you’re just beginning to kick around the idea of buying a condo, the first place to start isn’t with a realtor, Mayberry told us, but rather, with a mortgage professional, such as Higgelke. That way, you can get a clear picture of your current financial situation and will know how much you can afford before you start shopping around for condos that might be sitting somewhat outside of your snack bracket. Look at the numbers. Even if you’re not planning to buy for another 8-10 months, start looking at the numbers now. That way, you can ensure your credit is good, get ahead of anything that might give you a bit of trouble, and keep on track so that when your dream condo comes up, you’ll be in a good spot to whip out the ol’ pocketbook and make a deal. Take everything into account. This is doubly-important for condo buyers because it’s important to look at the whole picture when determining what you can comfortably afford – and that includes condo fees. It’s crucial factors these fees into your expenses, because they’re considered debt servicing and can have a big impact on how much you’re approved for at the end of the day. Start saving today. Seriously. Don’t start saving tomorrow, or next week. Start today. Because even if you’ve got a 20% down payment, you may still find that the new mortgage rules could dramatically impact your buying power. So, save those pennies (errr…nickels, now, we suppose? ), because the bigger a down payment you’ve got, the better off you’ll be when it comes time to apply for that lending. 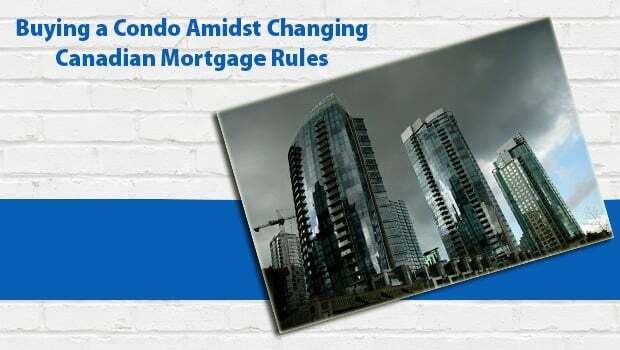 The new Canadian mortgage rules have the potential to make it more difficult to enter into condo ownership as a first-time homebuyer – but ultimately, these changes are to protect Canadians from getting in over their heads financially, which is definitely a good thing. We want to thank John Mayberry from the Calgary Home Boys for joining us to chat about the Calgary real estate market, and Josh Higgelke from Mortgage Connection for shedding some light on these recent mortgage rule changes. If you’re thinking of buying a condo in the near future, be sure to join the conversation and educate yourself so that you can make the right decisions when it comes time to make that big purchase – get in touch with folks who have experience with the ins and outs of condo ownership, and join Alberta Condo Owners for Change today for all sorts of helpful info and advice.